Complex mild perhaps not in the traditional sense but we like our beers hoppy! Ruby coloured, coffee, chocolate aroma with hints of dried fruits and sour cherry leads to a soft yet full roast flavour, fruit and malt vying with the rounded hoppy bittersweet finish. Not only for the mild fanatics but the bitter lovers too. Both will be left satisfied and wanting more. Cask @ Akkurat. Dark mahogany, small bubbly head. Gentle roasted malty aroma, dark bread, bitter dark chocolate and floral. Crisp and smooth mouthfeel. Floral bitter and roasted taste, dark chocolate, dates, hay and grass. Floral bitter finish. Always eagerly awaited and rapidly drunk here! Cask at GBBF ’16, day 2, 10/08/16. Dark mahogany brown with a decent beige cap. Nose is toffee, biscuit, straw, brown bread. Taste comprises earthy fruits, biscuit malt, caramel, sweet notes, grains. Medium bodied, fine carbonation, semi drying close. Decent flavoursome mild. Cask @ Bank, Manchester. Clear reddish-brown with a small creamy head. Smooth tasting with a few pale malts to be found. Sweeter in its nose. Has a mild chocolate flavour. Quite a decent ale on cask at the Southampton Arms. Had to get it because it’s named after one of my favorite Cream songs. Now this is rather scrummy despite a fairly low abv. Nutty. Dark, deep amber red colour, clear. Malty slight toasty nose. Dry red berries, malty grains. Med bodied, caramelly. Easy. Cask@gallows raf16. Dark deep amber red colourclear. Malty slight toasty nose. Dry red berries, malty grains. Med bodied, caramelly. Easy. Cask @Gallows bird Real Ale Festival 2016. Mahogany color, thick white head. Coffee and chocolate notes, slight plummy notes in aroma. Flavor has some metal notes, cocoa and coffee. Quite nice, thin of course due to the abv. Nice dark mild. A fine mild, distinctive in flavour and colour yet supremely drinkable as a session beer. A rare pint indeed! Cask at Nicholsons Drum & Monkey. Very nice beer... Quite surprising as it appears somewhat ambiguous at first sight! Quite a nice full bodied beer for its low ABV which goes to show strength isnt everything for complex beers. Mild roasted notes, hop up front, sweet syrupy taste with a dry roasted coffee finish. Great! Cask @ Guide Dog, Southampton. Translucent dark brown. Looks lightweight. Aroma and taste say otherwise! Aroma is maltissimo, still flavours as diverse as cherries and earth come through. Sweet and light with sour edges. Bitter aftertaste. A brilliant mild which excels with complex aroma and taste while remaining a mild in character. Forget hints of this, flavours of that. It's a superb pint.Best session beer I've supped for a long time. On cask in London . 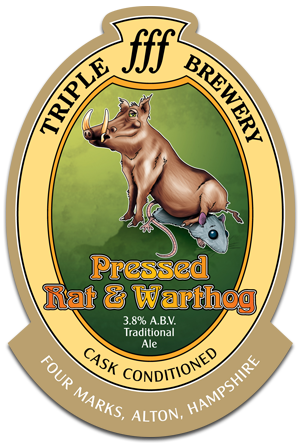 I had some time to kill before the trip back north so I ordered a pint of this at The Harp. It actually was a striking example of a mild. With enough flavor to be interesting but not so much that it killed the palate it proves that not all session beers are boring. I hope I can find a few more like this. Aroma / Appearance - The creamy little remnant of vanilla head decorated a brownish base. It sat in the glass like flat cola. Semisweet chocolate chips, coffee, and Jello pudding pops brighten the air with a velvety texture. Flavor / Palate - The creamy mouthfeel glides gracefully across the tongue. Chocolate toffee, oaky coffee, and more carry into a pleasant bitter finish. From start to finish this is a worthwhile beer. Grab some on cask when you see it next. Pours dark ruby brown with demerara and dried fruit on the nose. Rich dark fruit, a hint of licorice and dark chocolate on nose. Fab mild. Light taste of roasted malt, really enjoyably drinkable and well-balanced. Good mild.